This is the first book to illustrate how the eating disorder is used as a metaphoric voice -- sometimes the only voice available to a person with an eating disorder -- when relationships break down. It is a hands-on, working guide to eating disorder recovery that will help families understand causes of eating disorders and the impact they have on relationships. They will learn ways to work together to heal, repair, and rebuild positive interactions. Exercises and examples throughout the book demonstrate what to do that will help the entire family change patterns of communication, establish trust and empathy for each other, and learn how to listen to and understand the person with the eating disorder. Judy Scheel, Ph.D., LCSW, has been treating eating disorders for more than 25 years. In her years of providing treatment she has found that mutual respect, empathy, and trust provide the foundation for familial and relational repair and recovery from an eating disorder. Helping patients live authentically is the cornerstone of her approach. Dr. Scheel is the Founder and Executive Director of Cedar Associates, a private outpatient program specializing in treatment of eating disorders and other self-harm behaviors. She is a member of the National Eating Disorders Association (NEDA), Academy for Eating Disorders (AED), and the Eating Disorders Coalition, Inc.
As a practicing psychiatrist and educator who treats eating disorders, I am often asked the question by a patient, family member, or student, "What are the best available books to assist in the 'real world' treatment of eating disorders? Are there any books that offer guidelines that are accessible, sound, and not 'watered down'?" Dr. Judy Scheel's When Food is Family is such a text. I recommend it enthusiastically and will keep it on my bookshelf to suggest to families who come for consultation and treatment. 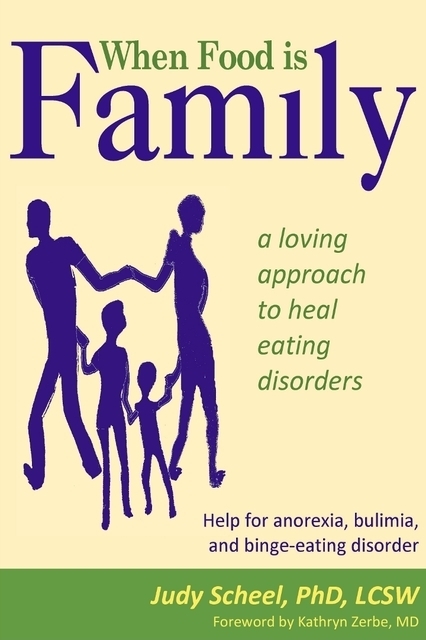 Families coping with clinical eating disorders have hungered long and hard for a book like When Food Is Family. Based on her decades of experience, Judy Scheel has written the clearest, most user-friendly guide to understanding and addressing the complex emotional and relational issues underlying these frightening and mysterious problems. No shame or blame games here -- just information showing how disruptions in relationships or attachments have affected the individual and how these can be healed. Clearly, concisely, and compassionately, When Food Is Family conceptualizes the eating disorder as a metaphorical quest for comfort through food and provides exercises to help families and patients develop a language of emotions so feelings can be expressed directly instead of through self-destructive behaviors. When Food Is Family fills a gaping hole in the eating disorder literature -- this is the one book I will recommend to all family members facing an eating disorder. Eating disorders create and deepen disconnection within families. Parents often struggle to understand their child's inability to change behaviors that are often life threatening and intractable. Eating disorders also thrive in disconnection and full recovery usually involves not only nutritional and weight restoration but real relationship repair and restoration as well. When Food is Family provides clear and sophisticated exercises for rebuilding attachment and connection. Grounded in the science and research of attachment theory, these guided self-explorations will help families re-establish the empathy, security, and connection necessary for lasting recovery from these complicated illnesses.